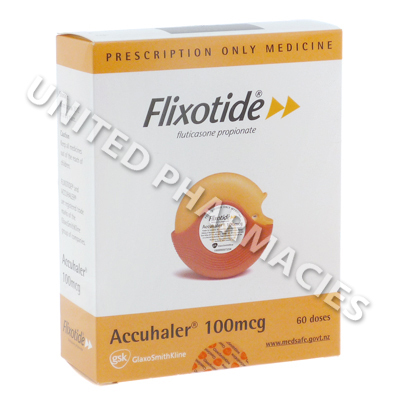 Flixotide Accuhaler (Fluticasone Propionate) is used to manage asthma, and to help prevent sudden onsets of breathlessness, coughing and other related symptoms (asthma attacks). 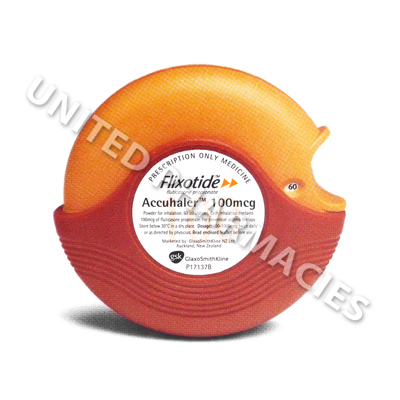 Flixotide Accuhaler (Fluticasone Propionate) is used to manage asthma, and to help prevent sudden onsets of breathlessness, coughing and other related symptoms (asthma attacks). Regular use of this inhaler is required in order for it to be effective. Its active ingredient is in a class of drugs called corticosteroids, and it works by preventing the body from releasing the substances responsible for causing inflammation, thereby reducing swelling of the airways and making it easier to breathe. If your doctor has prescribed Flixotide Accuhaler (Fluticasone Propionate) to you, it is very important that you follow the instructions provided to you. Refer to the instructions provided if you are not sure of how to properly administer the medication. Your doctor will tell you the correct dosage when prescribing this medication for you. It is important to note that the dosage can vary greatly, depending on the condition being treated. Adult patients may be prescribed a dosage ranging from 100 micrograms to 1000 micrograms per day. The dosage for children is less. To use the inhaler, remove it from the foil pack. You should then open it by pushing on the thumb grip and snapping the mouthpiece into position. Ensure that the inhaler is level and flat with the mouthpiece facing you. There is a lever which you must slide until you hear a click. After you hear the click, the counter on the inhaler will start to count down the amount of inhalations remaining. It is now possible to place the mouthpiece next to your lips, and inhale deeply through the mouth. Remove the inhaler from your mouth and hold your breath for roughly 10 seconds, before slowly exhaling. When you have finished, you should close the inhaler. If any side effects occur, you should tell your doctor, especially if the side effects are serious or persistent. In rare cases, this inhaler may cause patients to experience more serious side effects. If you notice unusual growth of facial hair, acne, mood changes, stretch marks noticeable on the skin, strange bruising or any other symptoms, you must see your doctor as soon as possible. Even though it is generally considered to be uncommon, there is a slight risk of developing cataracts or glaucoma associated with prolonged use of this medication. Discuss the risks of this with your doctor before you start treatment with this medication. It is recommended that while you are using this medication you carry an ID card or wear a bracelet which clearly mentions the fact that you are using corticosteroid medication. Always use Flixotide Accuhaler (Fluticasone Propionate) as you have been prescribed by your doctor. Never self-medicate or change your dosage without first consulting your doctor. The correct dosage can vary depending on your health, medical history, and the severity of the condition being treated.